This Certified Organic coffee comes from a high-elevation coffee estate in Kealakekua, Hawaii Island. Kealakekua is in the heart of the world-famous Kona Coffee belt, and this estate at 2,000 feet elevation is perfectly situated to produce exceptionally high-quality organic Kona Coffee. Each coffee fruit is hand-picked at the peak of ripeness, leaving the green, unripe fruit to be picked later in the season. Hand-picking ensures that none of the off-quality or overripe beans make it into your coffee. After picking, the beans are air-dried and eventually sorted by our optical sorter to again ensure that only the best quality beans make it to our roasting room and your bag of coffee. We roast our Organic Kealakekua Estate coffee to our signature Vienna roast level. This brings out a lot of the flavor that is not present in the lighter American roast and avoids the bitterness often associated with the darker French roasts. It is characterized by small spots of the natural oils on the whole beans. This is the ideal roast for these beans. This Certified Organic coffee was grown without the use of herbicides, pesticides or chemical fertilizers--all requirements to be Certified Organic. 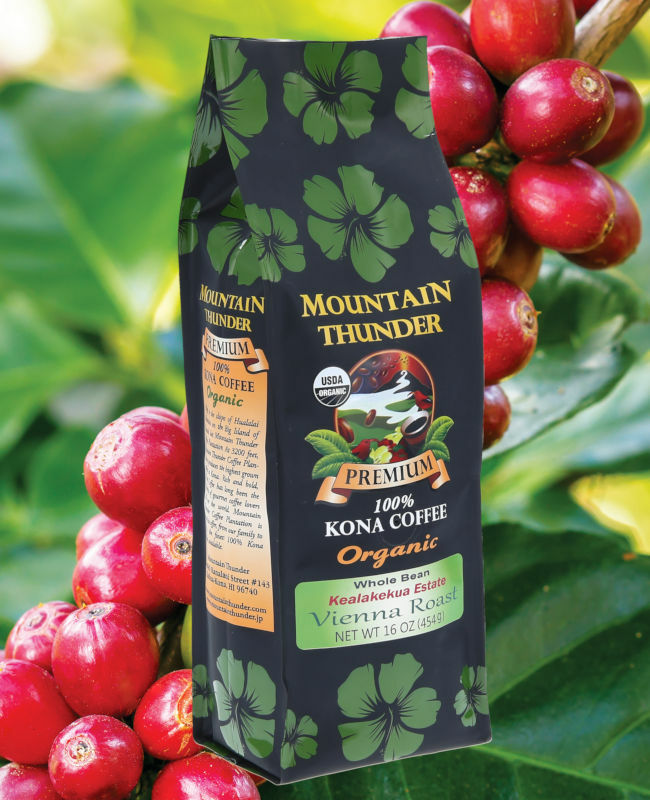 The processing of the coffee was done at our Mountain Thunder Coffee Plantation, which also has achieved Organic certification. The one overriding characteristic of this Organic coffee is the remarkably smooth flavor. With a very low level of bitterness, this light, mild body coffee is a remarkable Kona Coffee in every respect. There are slightly nutty and chocolate notes with a subtle, savory aroma. The coffee cups do not come with the coffee. You can, however, purchase them here.